What is a Techie Brekkie? ICTuesday’s, Techie Brekkies, Techie sessions, whatever you call them – if you do them right they will create an exciting sharing culture within your school. I have been involved with Techie Brekkies for a long time now and have been inspired by many other amazing teachers to run them and create a more fun-filled, collaborative culture in your school towards the integration of technology. This year I have implemented a professional development calendar for ICT as part of my role and this is sent out to all staff at the end of the term, ready for the next one. On the calendar it has scheduled dates and times for my ICT PD sessions, whether they are compulsory or optional and a short blurb about what it is about (a teaser). I wanted staff to not feel stressed, people need time and I am incorporating as much of these PD sessions into scheduled staff meetings as possible. The idea of all sessions I run is to inspire teachers to use it in their classroom and there is always an expectation from me that I will follow up and the staff knows they are accountable. I believe, the use of technology needs to be shared in a positive, fun and non-time consuming manner. Teachers don’t want to feel like technology is a burden and it is an added weight to their already heavy loads. Techie Brekkies are the new crazy at my school and we run these once or twice a term as optional sessions. 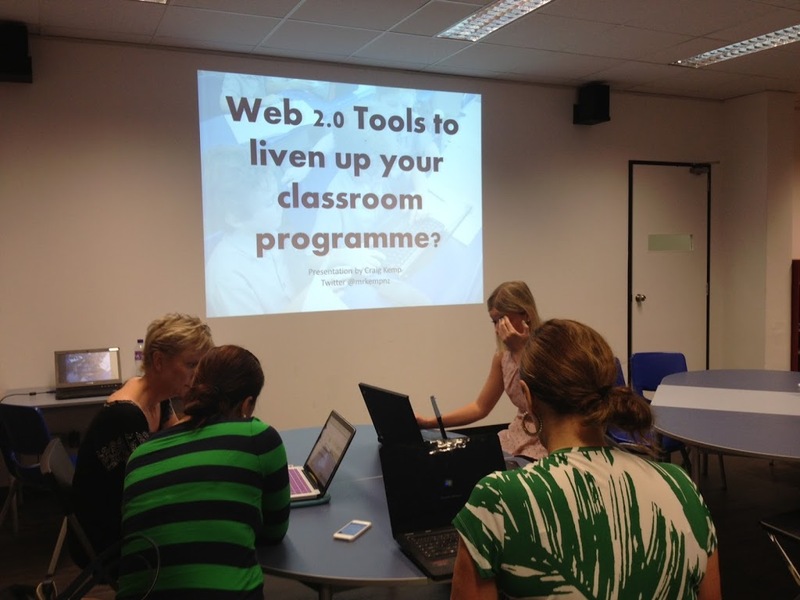 Our first session this year was on Web 2.0 tools to liven up your classroom programmeand for an optional programme I had 60% of staff RSVP and attend – I was amazed and none of us were disappointed. I was blown away by the up take on these fun tools and have seen them being used in each year level over the past 3 weeks since the session. I LOVE IT. I am now having so many requests for my Techie Brekkies that I have got too many ideas! I have staff keen to run sessions and the positive culture is slowly developing. 6. 30-45min for staff to have a go – follow links, play, interact, share, collaborate, discuss! 8. I follow up with all staff who share with me something they have done in their practice from what they learnt (this is then followed up with a classroom walkthrough at the end of each term – blog post coming soon). 9. I sent an email to all staff with some inspirational messages and the links to the presentation and tools – that way even those who didn’t attend can still get involved. The next important step for me is getting staff to create an online learning journal (similar to that I use with students that I mentor – see mentoring blog post) where they record their PD, post links of what they found and reflect on their teaching in a positive manner. This process has already personalised our professional learning experiences at my school and I continue to seek ways of improving this experience. Thank you to my Twitter PLN for inspiring me and exciting me every day. Here is an older blog post about Twitter vs Traditional PD. This post was inspired by many on my Twitter PLN – I would love for you to join as well and follow along and contribute in my learning journey. Please pass this on to your colleagues and join me in this exciting journey. Have a great week and stay inspired! I like Techie and I like brekkie, just have never put the two together, but have heard many positive things about them in the past. I began a professional journal/blog in January and shared it with the syndicate leader the other week and she has just told me that she began hers on Sunday so hopefully through osmosis we will get the whole staff of 7 teachers on board. Cheers Craig for your fantastic sharing. I think this idea is very practical because people leave with the feeling that they have actually acomplished something meaningful for their classes, the reflection is also vital for setting us on the right path and helping us steer ourselves to our goals. Thanks for sharing! teachers leave the class after having actually done something, great idea! Blogging helps us focus and reflect, thanks for sharing! We run them once a term by having 3×15 min presenters who introduce some ICT related item that can be used. Like the idea of follow up of what is one thing they can use! Might have to make two sessions a term to give them time to try something! I found this linked to a post about personalised learning… Should it have meant to be about staff lead PD? Correct and a way to personalise learning to staff needs …. links to both – personalised learning is for all, not just our students.